Sifonios, David 2018. Environmental Process and Production Methods (PPMs) in WTO Law. Vol. 3, Issue. , p. 255. CEZAR, RODRIGO FAGUNDES 2018. The Politics of ‘Dolphin-Safe’ Tuna in the United States: Policy Change and Reversal, Lock-in and Adjustment to International Constraints (1984–2017). World Trade Review, Vol. 17, Issue. 04, p. 635. BOWN, CHAD P. and BREWSTER, RACHEL 2017. US–COOL Retaliation: The WTO's Article 22.6 Arbitration. World Trade Review, Vol. 16, Issue. 02, p. 371. CONCONI, PAOLA and VOON, TANIA 2016. EC–Seal Products: The Tension between Public Morals and International Trade Agreements. World Trade Review, Vol. 15, Issue. 02, p. 211. DU, MING 2016. ‘Treatment No Less Favorable’ and the Future of National Treatment Obligation in GATT Article III:4 after EC–Seal Products. World Trade Review, Vol. 15, Issue. 01, p. 139. Akerlof, G. A. (1970). ‘The Market for ‘Lemons’: Quality Uncertainty and the Market Mechanism’, Quarterly Journal of Economics, 84(3): 488–500. Campbell, J. Y., Edmunds, H., Brigitte, J., Madrian, C., and Tufano, P. (2011), ‘Consumer Financial Protection’, Journal of Economic Perspectives, 25(1): 91–113. Fehr, E. and Rangel, A. (2011), ‘Neuroeconomic Foundations of Economic Choices – Recent Advances’, Journal of Economic Perspectives, 25(4): 3–30. Howse, R. (2012), Before the World Trade Organization Appellate Body: United States – Measures Concerning the Importation, Marketing and Sale of Tuna and Tuna Products (AB-2012-2/DS381), Amicus Curiae Submission, 17 February 2012, paras. 8 and 9. Howse, R. (2013), ‘Consumer Labeling on Trial at the WTO: Misunderstanding the Behavioral Law and Economics of Consumer Information, New York University mimeo. Howse, R. L. and Langille, J. (2012), ‘Permitting Pluralism: The Seal Products Dispute and Why the WTO Should Permit Trade Restrictions Justified by Non-Instrumental Moral Values’, Yale Journal of International Law, 37(2). Howse, R. and Levy, P. I. (2013), ‘The TBT Panels: US–Cloves, US–Tuna, US–Cool’, World Trade Review, 12(2): 327–375. Grolleau, G. and Caswell, J. A. (2006), ‘Interaction Between Food Attributes in Markets: The Case of Environmental Labeling’, Journal of Agricultural and Resource Economics, 31(3): 471–484. Kingsbury, B., Krisch, N., and Stewart, R. B. (2005), ‘The Emergence of Global Administrative Law’, Law and Contemporary Problems, 68: 15–62. Roe, B. and Hicks, I. S. (2007), ‘Credence Good Labeling: The Efficiency and Distributional Implications of Several Policy Approaches’, American Journal of Agricultural Economics, 89(4): 1020–1033. Anson Soderbery (2013), ‘Estimating Import Supply and Demand Elsasticities: Analysis and Implications’, Working Paper, Department of Economics, Purdue University, West Lafayette, IN, 22 April 2013. United Nations (1969), ‘Vienna Convention on the Law of Treaties’, 23 May 1969, United Nations, Treaty Series, vol. 1155, p. 331, available at: http://www.refworld.org/docid/3ae6b3a10.html. Teisl, M. F., Roe, B., and Hicks, R. L. (2002), ‘Can Eco-Labels Tune a Market? 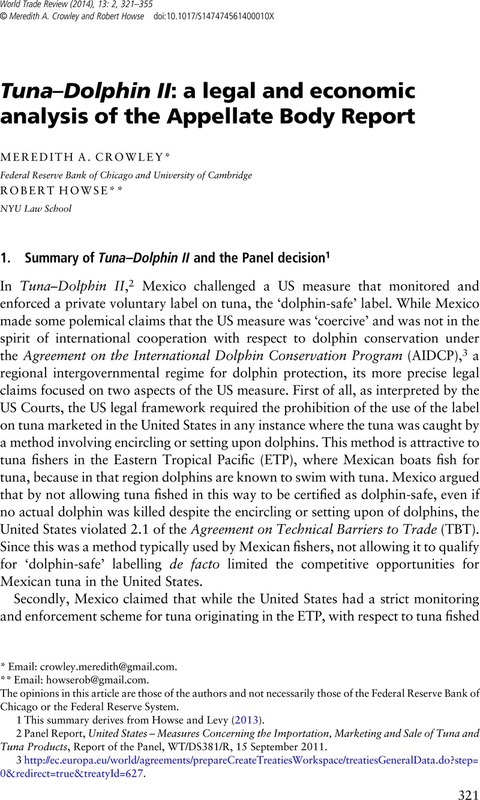 Evidence from Dolphin-Safe Labeling’, Journal of Environmental Economics and Management, 43(3): 339–359. Wijkstrom, E. and McDaniels, D. (2013), ‘International Standards and the WTO TBT Agreement: Improving Governance for Regulatory Alignment’, World Trade Organization Economic Research and Statistics Division, Staff Working Paper ERSC-2013-06, 25 April 2013.